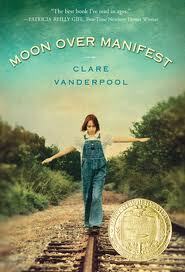 a book chick: "moon over manifest"
my take: this is a great younger read ... probably younger than the typical "young adult." it won the newbery award for 2011.
it's set in 1936 with flashbacks to 1917 ... it touches a bit on world war I, but otherwise is not a war story. which i found refreshing. it's set in small town kansas at a time when it was the melting pot of america. i cried at this one ... much like how i cry every time in the anne of green gables video when she tells the dying matthew that she just wanted to belong somewhere. i was waiting to see if the heroine abilene would find 'home'.